I love trying new recipes and the beauty of it is that you don’t have to cook them again if they are ghastly. This recipe caught my eye and I admit I was a little unsure of how the raw brussel sprouts would taste, but even during the preparation, the colours and textures and smells even brought my husband into the kitchen. The result was an outstanding success and it is definitely on my ‘cook again’ list. 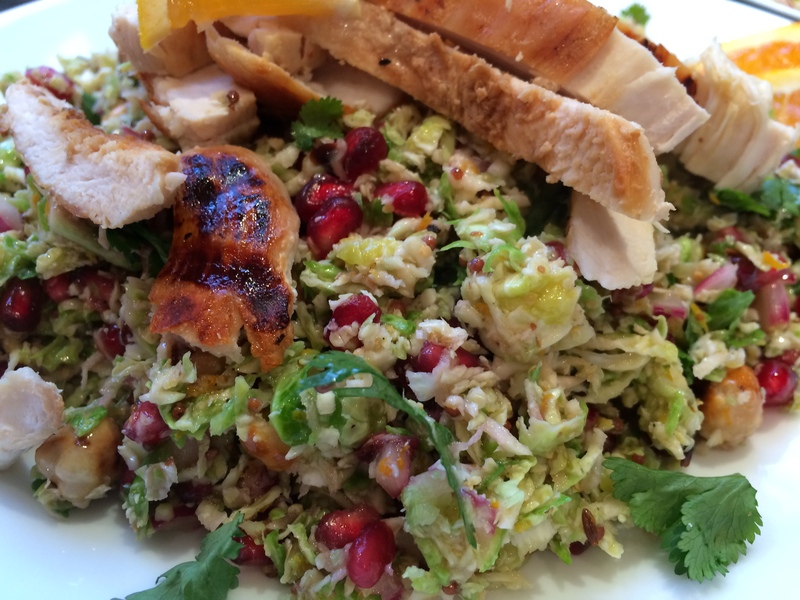 The salad itself is surprisingly juicy and tangy; the nuts and pomegranate seeds give a wonderful crunch. I chose not to chop my nuts and we rather liked the crunch of the whole nut. I decided to serve the salad with plain chicken breast fillets (just a few minutes in the George Foreman), cut into strips. I had half an orange left over from the recipe which worked well for decoration and for squeezing the juice over the chicken which was so tasty and complimented the citrus in the salad. Leave out the chicken and this would be a perfect vegetarian meal. Set a frying pan over a medium heat and toast the hazelnuts for about 8 minutes until golden here and there. Tip onto a plate and set aside to cool; chop roughly if desired. Toast the cumin seeds in the same pan for about 30 seconds until fragrant, then remove from heat. Whisk all the dressing ingredients (except the onion) into the pan with the cumin seeds. Season generously then add the onion and set aside. Pile the shredded sprouts into a large bowl and pour over the dressing. Toss very well. Set aside for at least ten minutes, or up to an hour in the fridge. Fold in the coriander, the pomegranate seeds and hazelnuts before serving. I added a few more hazelnuts than the 50g of the recipe just to use up the open packet. I also added more pomegranate seeds as my husband bought me 5 home when I only asked for two!! I found this recipe in the Good Food Magazine along with many more brussel sprout recipes, some of which I will be trying in the future. Brussel sprouts are not to everyone’s liking, but this recipe doesn’t ‘shout’ brussel sprout when you are eating it, so may be well worth trying. You may be pleasantly surprised. 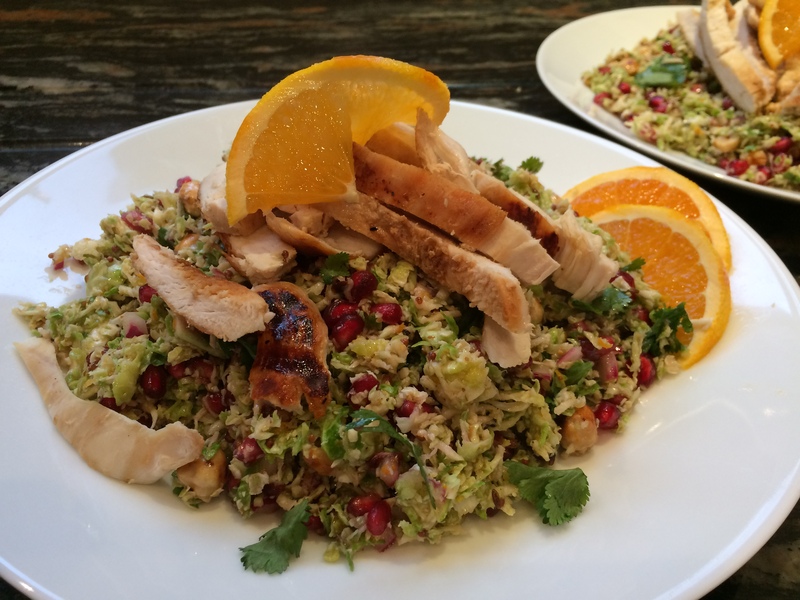 This entry was posted in Dinner, Lunch, Salads, Supper, Vegetarian and tagged Brussel sprouts, Chicken, citrus, Dinner, Gluten Free, Healthy Eating, Lunch, pomegranate, Salad, Vegetarian, Wheat-Free. Bookmark the permalink.